OK, good progress with this. 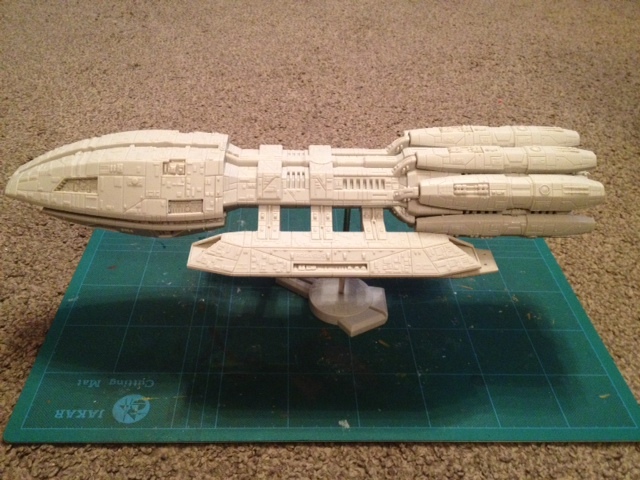 I ran off a sheet of decals and have started applying them to the hull. They’re going to have to go all over and my optimistic 1 A4 sheet is looking mightily depleted already. So going to need a few more for definite. Just cutting them out and fitting them on while trying to keep the orientation of the blocks more or less the same. Surprisingly wasn’t too time consuming to do. But think I will do a template for the engines as they’re are 8 of the buggers. Going to just keep updating this post rather than starting a new one for each update for this stage. Got the assembly completed and filled a couple of small gaps I had (around the inserts) which wasn’t 100% needed but it would have bugged me. And sanded down the joints on the hanger bay supports. Looks like these really need more detailing on them (which would also hide the seams) to be accurate, but not going down that route for this build. 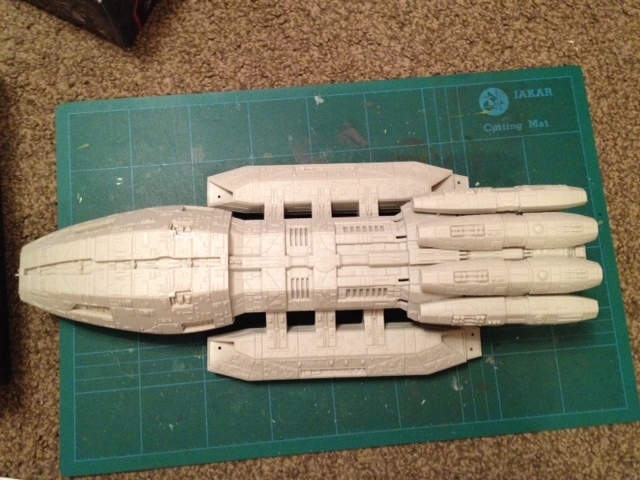 So got a coat of primer on and then a coat of Halfords Ford Machine Silver. 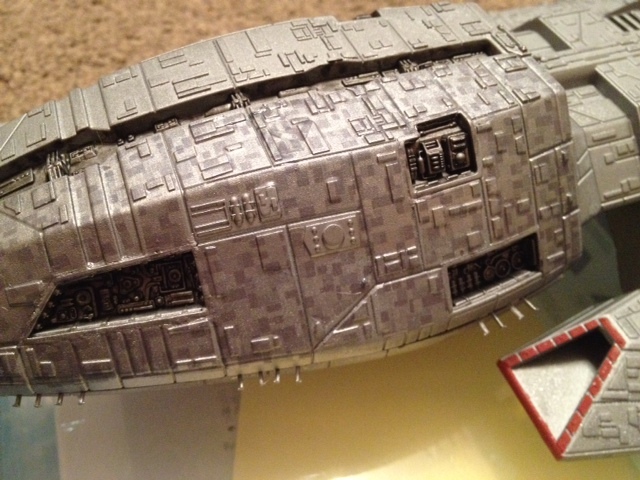 I’m trying to get a finish with is similar (doesn’t have to be identical but do want it close) to the Galactica. For that I know I used Halford Aluminium but I’d run out and the top of the Machine Silver looked very similar. But it didn’t come out anything like it. Hardly a metallic finish at all and much darker. More like a slightly metallic grey. Not sure if it’s because the can wasn’t properly mixed (it was a new one but did shake it for a good while) or just doesn’t even come close to the colour on the lid. Might even be that it was so cold when sprayed I guess? Anyway, here’s what it looks like at the moment. Going to start working on some texture decals now as pretty much got the assembly pegged. Well some really great progress last night. This really goes together nicely. Did get bit bored doing the engines so still got 4 to do. And no changes what so ever from the stock version. 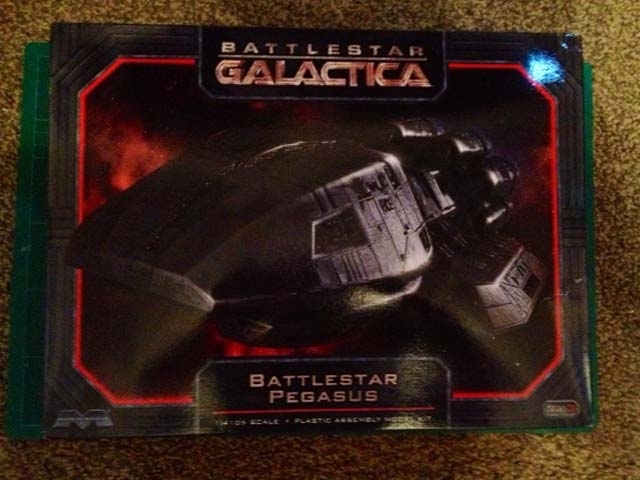 Well I was well and truely gobsmacked earlier today when a parcel arrived from Pete and inside was the Moebius Battlestar Pegasus. 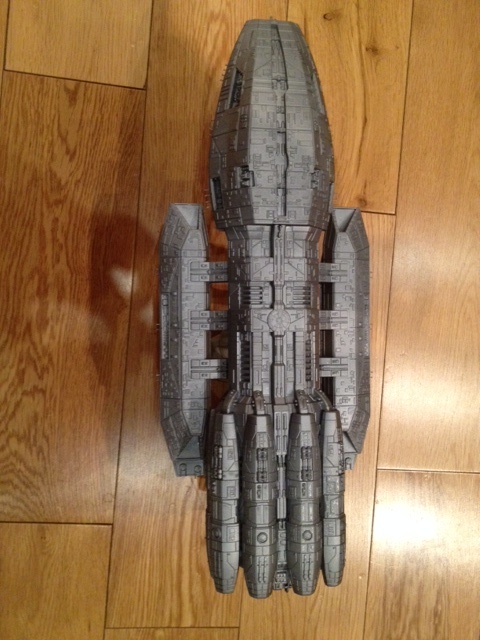 So a massive thanks to Pete for his generosity in sending this. But it came with a catch that there had to be a build diary. So true to my word here is the start.